On Wednesday 16th January the Football Association (FA) announced they had selected the Teenage Cancer Trust to be it's official charity partner for the 150th anniversary year until June 2014. This is really fantastic news for the Teenage Cancer Trust who will benefit from an initial donation of £150,000 as well as income from additional fund-raising during the year. David Brazier told MsMM.org that he was delighted in hearing the news. "Since we put forward the idea of Rugby Tackling Teenage Cancer (supported by the local rugby teams Hull FC and Hull Kingston Rovers allowing a bucket collection for TCT raising over £2,000 during their match in 2008) we have have been putting forward the idea of Football Kicking Cancer in the hope that some of the football clubs would support us. 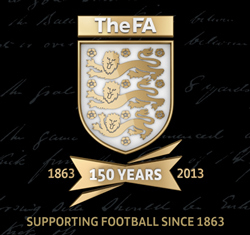 Now that the English FA have to support TCT in their 150th anniversary year it is really moved on beyond our wildest dreams!" 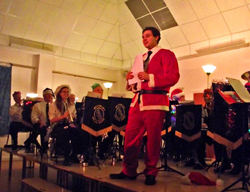 On 8th December Beverley Brass Band's Christmas Concert at Swanland Village Hall raised £311.00 for the TCT Unit at Castle Hill Hospital. On the 9th December a small group from beverley Brass Band played at Castle Hill's Remembrance Service and then toured the wards playing carols ending up at the TCT Unit (see below). 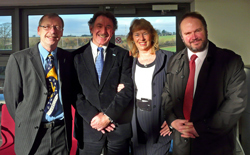 And, the 'MsMM gang of four' (David and Sheila Brazier, Will Richardson and Iain Colquhoun) were very pleased to be there to witness the event - after all it is what we, and many others, and this very website have been working towards for the past ten years or more! 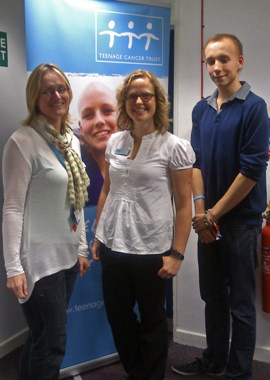 For more information about the UNIT at Castle Hill please see the official page on the Teenage Cancer Trust website. What a brilliant night - thank you Caroline, Kerri and Sue! And thank you also to Landermason. Twitter message from The Good Lovelies !!! --- Elloughton, that was fantastic! We couldn't think of a more delightful way to start the tour than with your lovely audience. You even came complete with four wonderful men who serenaded us with their rendition of Let It Be Me, by the Everly Brothers, to close out the night. 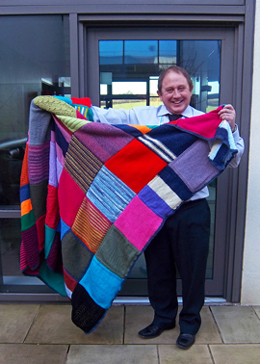 Steve Oliver, our friend from Castle Hill kindly agreed to hold the blanket made from squares knitted by tax inspectors from Cherry Court, Hull. The idea for the squares started during a Learning at Work demonstration by Sheila and Elaine, earlier this year. Learning at Work is an initiative by Unions to encourage staff to learn a new skill. Elaine had the idea of knitting squares towards blankets to be sold/auctioned for charity. She could not have imagined how her idea would grow as colleagues started to produce squares. This is the third blanket which has been completed, each containing more than 142000 stitches! Staff at Cherry Court have been enthusiastic supporters of the Teenage Cancer Trust for many years and look forward to their blanket being auctioned for the charity at a forthcoming event. 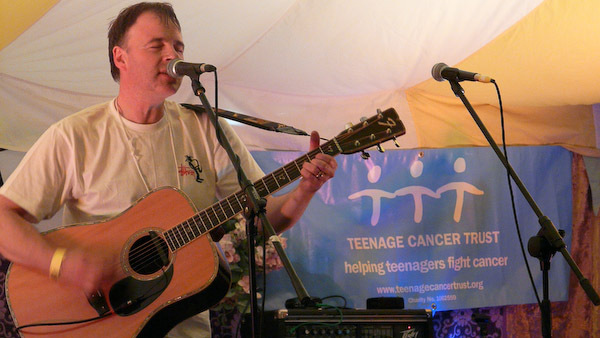 It seems a long time since June 2002 when we had our first gig in the garden, hoping our friends would enjoy our acoustic music concert, and raising “a bit” of money for the Teenage Cancer Trust (TCT). We named this “Midsummer Music Madness” because it was summer and it was definitely madness to plan a back garden event in view of England’s fickle weather! Please see our website www.msmm.co.uk to see where this has led. "I first heard of The Teenage Cancer Trust early last year and had the opportunity to support the fund raising whilst working at the Argos store in St. Stephens Shopping Centre, Hull. I suggested 'Naming The Bear' to the managers at Argos who fully supported the idea. To bring it to the attention of the local fundraisers, I asked Sheila Brazier to choose the bear, accessories and name. From a list of names customers and staff had to choose the name of the bear. We ran the raffle for ten days during the run-up to Christmas. 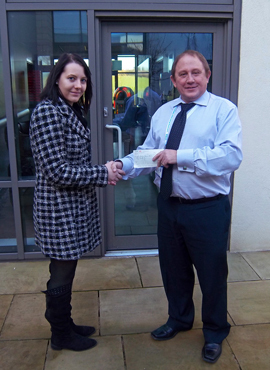 It was very well supported by customers and staff and we raised £45 towards the local fundraising activities." The Rotary Clubs of Hull and Barton on Humber are pleased to announce that the 2012 Humber Bridge Half Marathon and Fun Run is in aid of the Teenage Cancer Trust and other local Rotary charities. It is expected that over 2000 runners will register for the 2012 Humber Bridge Half Marathon (starting at 9.00 am) and over 700 for the Family Fun Run (starting at 9.30 am), which will take place on Sunday, June 24. The Rotary Club of Hull, which organises the event each year with invaluable help of the Rotary Club of Barton on Humber, expects record numbers and publicity for this year's event. The organizers are very pleased to confirm that the main sponsor of this year's races is The Co-operative Family who also sponsored the 2011 event. The Humber Bridge Half Marathon & Family Fun Run is being supported by several other local organisations and being it's thirteenth year, is now a major event in the local running calendar. The 2011 event raised over £31,000 for the main local charity plus an estimated similar amount for runners' own charities and this year's races are expected to produce a record yield. www.humber-half.org.uk or by calling 01482 560907 (Rotary Club of Hull c/o The Village Hotel). A Big thank you to all who attended the Beverley Brass Band Christmas Concert at Swanland Village Hall on Saturday 10th December. What a night! And with your help from ticket sales and the raffle we raised a total of £321.18 for the brand new TCT ward at Castle Hill Hospital! 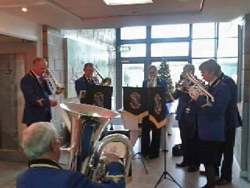 The band also played some carols at the ward the following day which went down a treat. 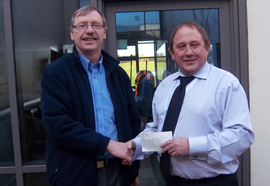 Iain Colquhoun, representing Beverley Brass Band is seen right handing over the band's cheque to TCT's Steve Oliver outside the TCT unit at Castle Hill hospital, Cottingham. Iain said that the concert evening went so well he has booked Swanland Village Hall for hopefully and equally splendid night out with the band on Saturday 8th December 2012! Find out more about Beverley Brass Band and when and where you can listen to the band elsewhere. The Msmm.org gang joined other TCT fund-raisers at Hull College to get an update on the Castle Hill TCT Unit. It is, as you are aware, a little behind schedule but the good news is that it should be fully operational by the end of this year! Already 150 teenagers have benefited from the unit which is costing £220,000 just to open. 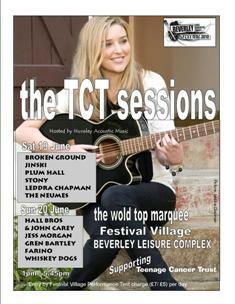 There will also be ongoing costs which means that it is vital that we all keep on raising funds for TCT. Presentations were given by Julie Watson, Lead Nurse at the unit (above left), Abby Batchelor, Regional Fund raising Manager (TCT) Yorks & Humbs (centre) and by Nick Massey (right) who told us his own experiences of initially the lack of a unit near Hull and the benefits the new TCT unit has already brought to him as a patient. 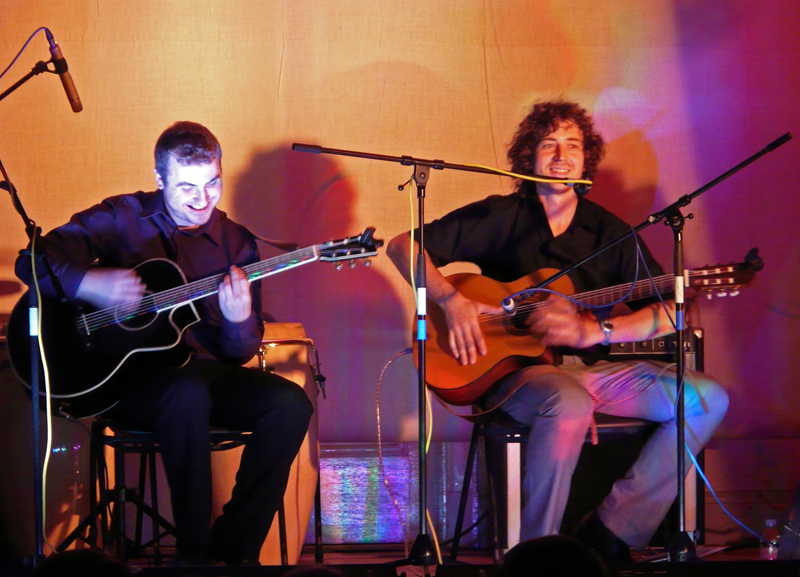 Graeme Wrightson and Jon Shepherd the amazing Hull based duo Farino headed an evening of acoustic and electric entertainment at a packed out Welston Memorial Hall featuring some of their favourite musicians from around the area and beyond. 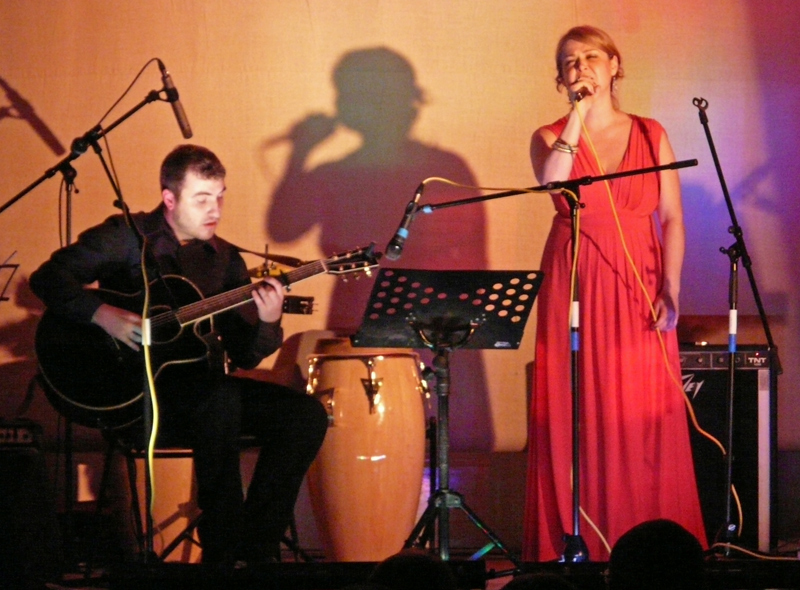 Graeme has signed up to climb Kilimanjaro for Dove House Hospice and the musical evening was arranged through HAM to help raise funds for his challenge in support of Dove House Hospice. Graeme told MsMM.org that he was overwhelmed by the amount fo support he had received for the evening and his challenge and confirmed he and his friends had raised a massive £943.00 on the night! Grameme went on to say that he had set a target of £3,000 eariler in the year but as he had already passed the £5,000 mark he had again upped his target now to £10,000. You can follow Grameme's progress on his new tweet @graemescharityevent. 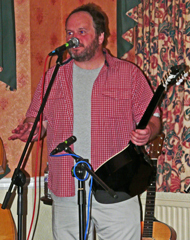 Nick Stubbs organied an all day Music Event at the Victoria Hotel in Hornsea to raise yet more funds for TCT on Saturday 27th August from (12 noon till late). Nick has been organising these events for several years now and aslo organised a similar event there in May and raised £447 For TCT! We raised £ 475.00 !!!! With a great raffle organized by Helen with lots of friends giving prizes as well as all the performers and collection with the big TCT buckets . I feel quite humbled by all the support we get. Well done Nick from all of us at MsMM.org.uk! 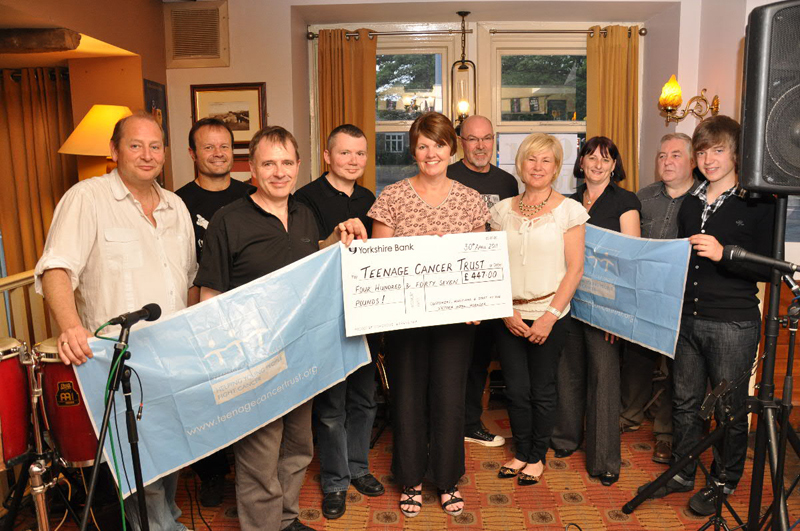 (Below) Nick, Helen and friends with their wopper cheque after their all day concert back in May. 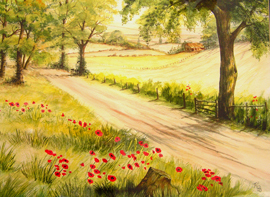 Swanland artist Roz Jordan-Jackson kindly donated her 'Wolds Lane' painting to help raise funds for TCT at the recent Moonbeam's Folk Festival. Her painting was raffled at the Wold Top Moonbeams Folk Festival which took place at the brewery on the weekend of 8th and 9th July. A great time was had by all! You cannot really have a bad time camping at a brewery! The actual raffle draw was made before the final main stage concert. The raffle raised £320 which will be presented to the Teenage Cancer Trust unit at Cottingham Hospital in due course. I am hoping to engage the newspaper for the presentation of the cheque by Leila Slater-Moonbeams organiser to the unit nurse. I will let you know when I have a date. A big thank you to Roz and Will and everyone who bought raffle tickets and helped out to raise the £320 for the TCT unit!!! 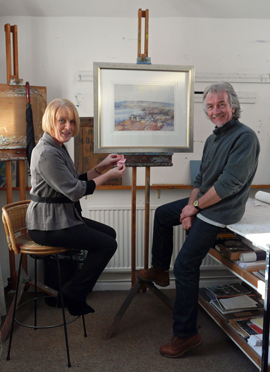 Since his Christmas 2009 exhibition, Tom Harland has made the Teenage Cancer Trust his charity and has raised over £2000 from his raffles held during his prestigious one man show at the Beverley Art Gallery in the summer and his Christmas exhibitions in 2009 and 2010. Tom has very generously donated 3 of his special limited edition prints for raffles – fabulous prizes for the winners! Many Ferriby residents have prints of his classic paintings of the village but may not know of his work of subjects further afield. Please visit his website www.tomharland.com or better still, call at his studio in Low Street on a Saturday morning. He may even make you a cup of coffee as you chat about his work! We are very grateful to Tom and his friends for their support also to Julie for drawing the winning numbers from Tom's Christmas 2010 (third) raffle. Julie Abrahams, Chairman of Children and Young People Overview Scrutiny Committee, pictured with Tom, his painiting and teh winning toicket. 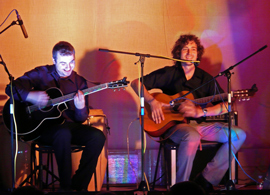 Singer songwriter Ewen Carruthers died unexpectedly on 4th October 2010 in Rotherham. Some of you will be familiar with the man and his music. I for one have been a great admirer of his work for many years. I regularly saw him perform in the old smokey folk clubs of the West Riding when I was a lad ! Two of my many favorite songs are 'Paris' and 'Rubenstein Remembers' but these are just a couple of masterpieces created by Ewan. 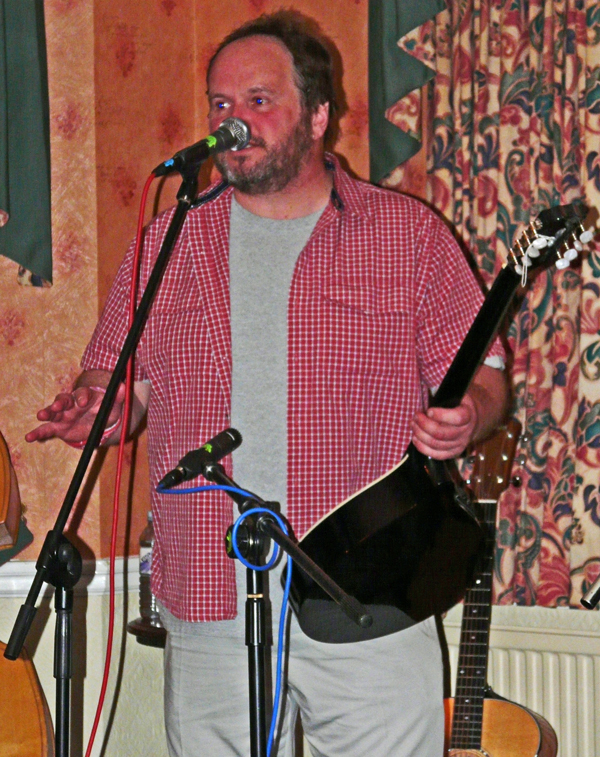 Ewen has played at the Half Moon on more than one occasion over the years and his songs have been performed and recorded by many artists including Elbow Jane - Graham Hodge - Mike Silver -Alan Taylor, to name but a few. Close friends describe Ewen as a quiet, gentle man. Through his music he was able to express himself so very much and take you to places you just dream about. 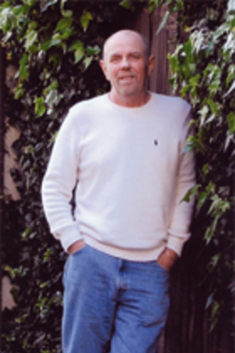 Music was his dear love and his love of the English language allowed him to be a prolific song-writer. He lived the later part of his life in America before returning to Yorkshire a short time before he died. On Wednesday 29 September many local TCT supporters and fundraisers were present at the launch of the new ward at Castle Hill Hospital. The ward will give teenagers needing treatment for cancer a purpose built ward specifically designed to give them the best chance of recovery. The ward which is built, but not yet furnished, is hoped to be opened in February 2011. The launch by TCT was to allow supporters to see that their hopes are finally turning to reality but also make them aware that they still need a further £100,000 by next February. Those of us behind MsMM.org.uk and our sister site Rugbyttc.org have been working towards making a specialist teenager unit possible in Hull for many years now and for us yes it all started in the garden. Since then we have been eternally grateful for the help and generous support given to us over the years. However, we hope that you will continue to support our TCT events so that we can help TCT raise the last few pounds to make this new ward operational by February and beyond. Thanks to Will Richardson, HAM and the following artists for giving up their time to help raise £345.00 in funds for the Teenage Cancer Trust via the bucket collection in the TCT Tent. 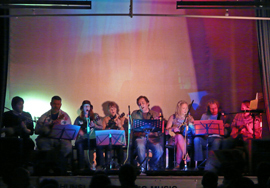 LEDDRA CHAPMAN, JINSKI , PLUM HALL, STONY, BROKEN GROUND, THE NEUMES, HALL BROS and JON CAREY, JESS MORGAN, GREN BARTLEY, FARINO and WHISKY DOGS. 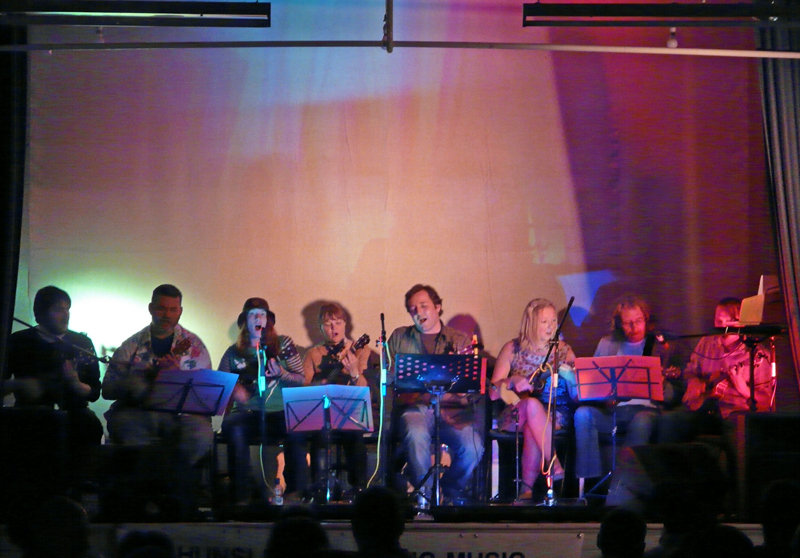 Grateful thanks also to all you generous people who donated and the Gig Shop, Hull for providing the sound and all the volunteers at the Beverley Folk Festival who helped out and made this another great event. See you again next year! Saturday 13th March was the long awaited date for followers of this inimitable singer. Born in the south of France, Flossie has lived in Darlington for some years and the resulting accent is a joy to behold. 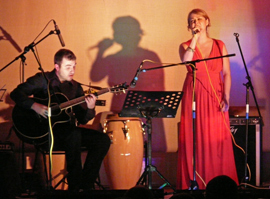 Providing fun and frivolity (yes the audience were at times in stitches) Flossie also showed she is a great singer with a voice that has been described as being ‘as clear and tuneful as a lark’. Singing songs made famous by Janis Joplin, Edith Piaff and Jacques Brell she is a fantastic performer who had the audience laughing one minute and crying the next. 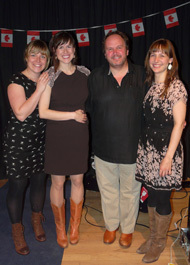 The overwhelming feeling of those present was that we hope Flossie will return for another concert perhaps next year. If you missed her and can't wait that long to find out what you missed the please visit Flossie's own website and make sure you click on the French flag to hear Flossie sing some famous French songs or the English one to hear English songs. Swanland Village Hall was the venue for this evening with the profit of £430 being divided between the TEENAGE CANCER TRUST and H.E.A.R.T U.K. - The Cholesterol Charity. 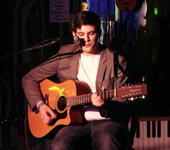 A local, young singer songwriter, Matthew Colquhoun supported Flossie playing in his home village of Swanland for the first time. 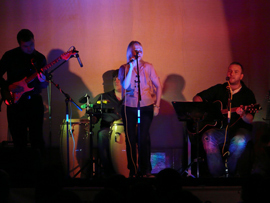 Another Swanlander teenager Jemima Short entertained during the interval when the organisers managed to raise more money for the two charities through a well supported raffle. The Grand Ice Ball was held at the Ramada Jarvis in Willerby and over 250 generous people turned out to help raise over £10,000 for Teenage Cancer Trust. 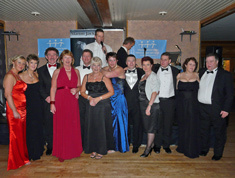 Here is the link to the photographs taken by Iain at the ball. £1.80 for each photo ordered will go to TCT. Enjoy and thanks for your support! The “ICE” in this case was a diamond worth £3,500 generously donated by our main sponsor Guest and Phillips Jewellers. Jill Turner was the lucky winner of the diamond (inset) set in platinum. The organisers held a raffle and auction and following an excellent meal everyone gave generously for TCT before dancing the night away. Congratulations to all who helped or took part in this wonderful event. The weather forecast for 1st August suggested that the best weather we could expect was light rain! This forecast proved very slightly pessimistic but we certainly experienced challenging conditions. Fortunately the gazebos kept everyone dry and did not blow away. The musicians were fabulous, their PA and lighting systems did not cause sparks to fly and our garden did not end up like a swamp. Everyone who came enjoyed the evening and will not forget it. At 8 o’clock there was an amazing sunset (we are not sure where that came from as there had not been any sunshine all day) and a magnificent rainbow which was reflected in the unusually calm river. "Life is not about waiting for storms to pass ---- it’s about learning to dance in the rain." ..... How true! Climbing Mountains, Party and Fun! On Tuesday 28th July the North Ferriby Slimming World group had their monthly tasting evening at the Church Hall. 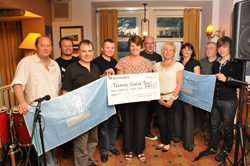 This meeting was very special because Heather Bowen of the Teenage Cancer Trust (TCT) joined them to help taste the fabulous food and to receive a cheque for £2000 raised by the members’ sponsorship from climbing Cat Bells. Heather was intrigued to hear that the 15 members who climbed the mountain had lost the weight of 3 people! She was delighted to have the opportunity to speak to the members about the work of the Teenage Cancer Trust and said how important such donations were to the charity. She told them about the special facilities being planned for the new ward for young people at Castle Hill and assured them that their sponsorship money would go towards this project and would be spent wisely. A photographer from the Hull Daily Mail came to record the event and the picture was in the newspaper a few days later. Heather has been the regional fund-raising manager for only a year, but regards the East Riding as her second home and with huge affection after having been welcomed so warmly by individuals, businesses and organisations. She is a very confident, passionate speaker and would be pleased to speak to groups who would like to hear more about the work of the Teenage Cancer Trust. 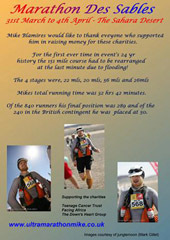 Mike Blamires has completed the the Toughest Footrace on Earth, the Marathon Des Sables. Mike was running 151 miles across the desert in 4 days to raise money for the Teenage Cancer Trust, Facing Africa and The Down's Heart Group! See Mike's photos at Picasa and read about the build up and the race itself on Mike's blog or visit Mike's site where you can make a donation. As Rugby Tackling Teenage Cancer is becoming a significant force within the Teenage Cancer Trust, David and Sheila were very proud to have been invited, along with some of their friends who have organised the Ice Ball, to the opening of the new Teenage Cancer Trust ward at Jimmy’s at Leeds. This was opened by Sarah, Duchess of York, who is the patron of the charity. She was accompanied by Princess Eugenie, her younger daughter, and both are very committed to the work of the TCT. The group from Hull felt inspired by meeting other fund-raisers and felt very privileged to be able to see the fruits of their labours as well as meeting some of the young patients. New friends and contacts were made. The photo shows Paul Brusby, Brian and Sharon Brooks, Martin and Theresa Rowland, David and Sheila Brazier with Sarah and Princess Eugenie. Unfortunately, work commitments meant that Keith and Jenny Charlesworth and Ian and Lorraine Garmston were unable to attend. 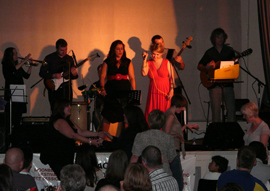 We look forward to another event (an annexe in Cottingham!!!) when all the team will be able to attend. Local TCT supporters had a ball at Willerby Manor Hotel on Saturday 8th November in aid of the Teenage Cancer Trust. Those taking part had a chance to win a half carrot diamond worth £1,000.00 (sponsored by Hugh Rice the jewellers). Who won the half carrot diamond at the ICE Ball?